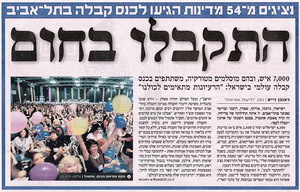 The largest (700,000 copies) Israeli newspaper Yedioth Ahronoth (Latest News) published a big article about the Convention. Excerpt from the article: “An Israeli, a German, a Turk, a Swede, a Romanian, and an Englishman met in Tel Aviv. This is not a beginning of a joke. It really happened yesterday at the yearly Kabbalah L’Am Convention. Question: If I feel my alienation from a friend, or perhaps a friend seems more distant from me, can I say that the same happens to me with respect to the Creator? What can I do in such a situation? Answer: States can be different; therefore, if we are talking about one friend, the parallel with the Creator is possible, but not in all cases. Here there is something additional, which is how much I appreciate the group and the goal that we are revealing among friends. After all, the group, the purpose, and the Creator are one. Only the group is the vessel, the desire (Kli,), while the Creator, the attribute of bestowal, is the Light that fills that desire, manifesting itself in the desire to the extent of their mutual equivalence. Eventually, the vessel and the Light become completely equivalent by achieving the property of mutual bestowal and unity; they will become inseparable. Thus, one should attribute to the group even more importance than to the Creator. The group is a means, without which I cannot reach Him, and at this stage what is important to me is the means. Rabash gives an example of an unimportant government clerk from whom I depend more than from the entire government: While ministers are busy with state affairs, the clerk makes specific decisions about my case, either by approving or rejecting it. The Group is a meeting of our little desires, striving to reveal the Creator, the attribute of bestowal. I must once and for all decide: I cannot turn to the Creator on my own. My message is carried out only in the group, and as for the Creator, I don’t know who He is, but He will be the one revealed inside it. Question: Is living during the last generation an enormous and serious responsibility? Answer: On the contrary, living during the last generation is not a serious responsibility; life is very good and easy! Everyone cares for me, everything is well, I am surrounded with the love of my friends, and the Creator bestows good upon me through them. The revelation of the face of the Creator means that life begins to work out, I become healthy, problems disappear, and I feel good and comfortable. And I see the rest of the world around me the same way: I see that everyone has a good life! I see the entire Upper World revealed before me and it is eternal. I no longer count the moments of my life that were given to me until the day I die without knowing what will happen to me tomorrow; rather, I dissolve in the World of Infinity. So why should I expect this to bring me problems? There is no evil in the world; I “connect for good!” And this is exactly what we want to achieve during our convention, so it will have a constant good influence over us. All the worries and expectations of difficulties need to be erased and discarded, because none of this exists! At the moment when you connect with friends and wish to reveal the Creator in this connection, you fall under the best possible influence of the Source of all the good. There is no other force beside it that could influence us. Through the group you connect to the strongest and kindest source of energy. You just need to keep strengthening this connection over all the obstacles, and that is it! We will try to do this over the three days of the convention, and we will see that all of life can be organized and arranged this way. You acquire a fantastic force through this connection, which enables you to achieve success in anything you do in life. But this can only happen on one condition: that you want to be connected with this force because it determines all the actions and events in our world. And you will absolutely, clearly reveal it. You will feel like a child, grabbing on to the hand of an adult and taking the adult anywhere he wants. Like a little child, who takes his mother or father by the hand and pulls them so they would do for him what he himself cannot do. And you will do the same with the Creator: He wants you to! Let us hope that we will be able to achieve Him taking us in His arms and helping us do everything we need to do! Question: Why do we need hatred? Answer: While I am not familiar with you, there is no mutual inclusion between us, the connection between us is not revealed, and I don’t feel hatred toward you. You may live somewhere in Alaska, and you are not my concern. However, the closer you are to me, the more you enter my field of vision. If you are my neighbor, I watch you carefully: You left garbage somewhere; yesterday there was a lot of noise coming from your apartment, and so on. In this manner, we reveal how connected we are to each other. However, we are all egoists. Therefore, our ego, plus the connection between us gives birth to hatred. Question: But when will this hatred go away? Answer: It won’t go away! We have nowhere to go and nowhere to run from each other. This is the problem! We need to reach peace and agreement between us above our hatred without destroying it, but by rising above it. This constitutes the achievement of perfection, as it is written: “All sins will be covered by love!” The word “Shalom” in Hebrew means perfection (Shlemut). Today the world is becoming global, and everyone is connected to each other as one system. Therefore, joy is possible only in the case that I am sure that others are satisfied. If everyone feels well, I will also feel well. Otherwise something unexpected can happen at any given moment, and no one has a sense of confidence or safety. The world has become very close-knit, threatening, and hostile, and it is only possible to achieve happiness under the condition that we unite; this is called joy from good deeds or acts of bestowal. If I am sure that I am providing fulfillment to other people, then they have an egoistic interest in me. I am a source of their fulfillment, and this gives me a sense of confidence that I will be all right; I will be filled myself, and I will fill others.